If I didn’t know better, I’d say JBL took the winning design of its Charge 2+ portable Bluetooth speaker and handed it off to Hanz and Franz for a month-long pump-you-up camp. The Xtreme is a super-sized, barrel-bomb of a speaker that delivers ludicrous amounts of bass from not one but two 2.5-inch transducers, aided by 3.0-inch passive radiators capping each end of its tubular design. A pair of 1.5-inch tweeters struggle to keep up with all that boom. Like Creative’s Sound Blaster Roar 2, the Xtreme is a bi-amplified system, with one amp driving its woofers and a second powering the tweeters. But to my ears the Xtreme sounded unbalanced in favor of the low end in comparison to both the Roar 2 and Jawbone’s Big Jambox. Massive passive radiators at either end of the Xtreme serve up ridiculous amounts of bass. The Xtreme’s size and weight—at 5 pounds, it’s more than twice as heavy as the other two portable speakers I listened to—make it difficult to grasp and lift with one hand. Fortunately, JBL provides a rugged, adjustable, 2.5-inch-wide shoulder strap that you can clip to the speaker so you can lug it around. That, and its ability to withstand the elements, render the Xtreme a better choice of an outdoor speaker than the other two. JBL describes it as “splashproof” and says the speaker can withstand being rinsed under a faucet as long as it’s not submersed. Quarter-inch-high rubber feet elevate the speaker to help protect it from puddles. 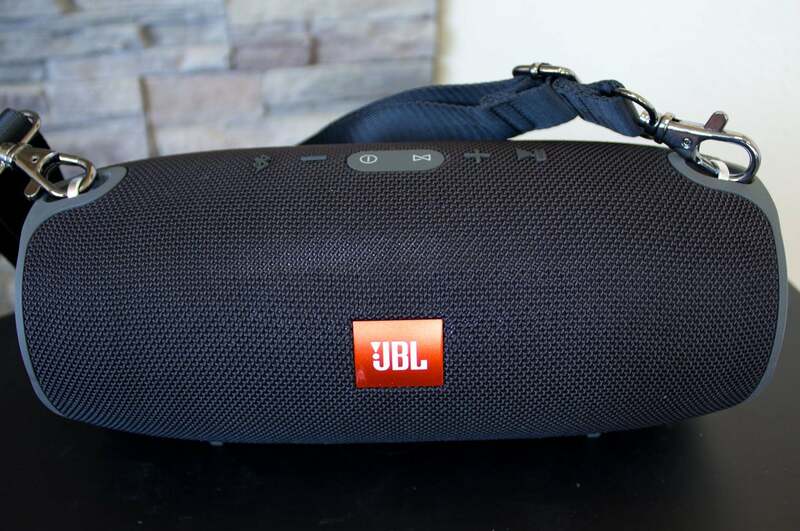 You'll appreciate the carry strap JBL provides every time you pick up this five-pound speaker. Four buttons are provided for pairing a Bluetooth device, adjusting the volume, and toggling play/pause modes. It’s good that they’re raised, because the black-on-black buttons very difficult to see in low light. There are no buttons provided for skipping back and forth on a playlist. As with the Big Jambox and the Sound Blaster Roar 2, you can also use the Xtreme as a speakerphone. Unlike those speakers, you can pair the Xtreme with up to three Bluetooth devices and take turns playing music from them. 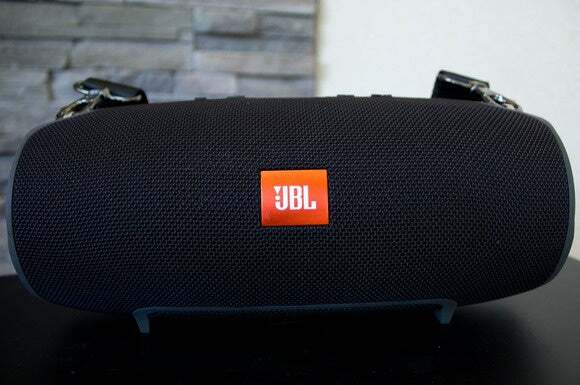 You can also wirelessly link multiple JBL Connect speakers together and have them all play the same music. Bass fiends will like the Xtreme’s extreme bass response, but I found that it delivered just a little too much of a good thing. And at $300, it’s considerably more expensive than the other two contenders. It is, on the hand, the best choice in this roundup if you’re looking for a portable speaker you can take camping or to the beach. The zippered cover over its many ports is a very smart idea. 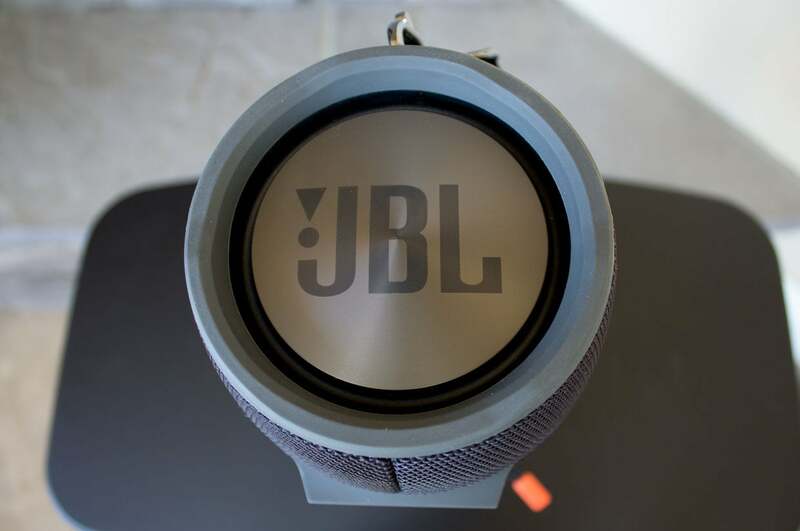 Some people will love the JBL Xtreme for its bass response, but some will find it unbalanced in favor of low-end frequencies.